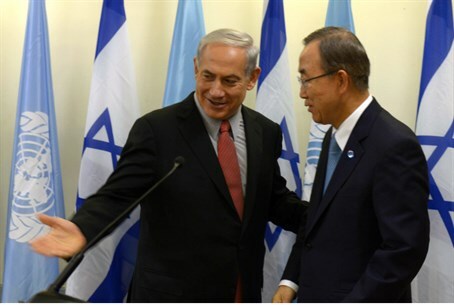 The Arab-Israeli conflict is rooted in the Arabs' refusal to recognize Israel, Netanyahu tells UN chief. The Israeli-Arab conflict has nothing to do with the “settlements” and everything to do with Arab refusal to recognize Israel as a Jewish state, Prime Minister Binyamin Netanyahu told United Nations head Ban Ki-moon on Friday. Netanyahu and Ban met in Jerusalem, and the Prime Minister asked Ban to look into the UNRWA summer camps in Gaza which are used to delegitimize Israel, call for its destruction and educate Palestinian Authority Arab children to carry out jihad. “I know, like me, you want to see the peace process which has been resumed, succeed. I know that like me you know that the most important thing is to prepare our respective peoples for peace and in this regard, I’m sure you are going to look into the abuse of UNRWA camps in Gaza that have been used purportedly for peace camps, but actually to instill the culture of hatred and the ideas of destroying Israel amidst Palestinian children,” Netanyahu said. “It’s very hard to habituate and prepare the next generation for peace when they’re told that Jews are the descendants of pigs and monkeys and that the Jewish State has no right to exist, so I trust that you will make sure that these abuses of UN goals and UN funds does not continue,” he told Ban. The real issue, added Netanyahu, “is how to get a demilitarized Palestinian state to finally recognize and accept the one and only Jewish State. These and other matters of course will I’m sure inform our discussions. There are a few other things that I prefer to discuss with you privately, but I do look forward to discussing with you all these and other issues and I welcome you once again, Mr. Secretary, to Jerusalem." Earlier on Friday, Ban called on Israelis and PA Arabs to overcome "deep skepticism" that he said risked thwarting efforts to reach a peace agreement. "Both sides need to sustain an environment conducive for the peace process to move forward," he said speaking two days after peace talks resumed in Jerusalem.